Many had lost faith. Few believed it could be down. In what? The Kings offense and their ability to find the back of the net. It became a common occurrence for the Kings' defense and goaltender, Jonathan Quick, to anchor the team and allow one maybe two goals and the Kings still not have a shot at the win because they could not light the lamp. The Kings are currently on a season high six game winning streak, and in the past 13 games the Kings have gone 10-3-0, outscoring opponents 42-25. Which has helped move the team's goals per game average up to 2.26 goals per game, a night and day difference compared to their 2.01 average before this run started. 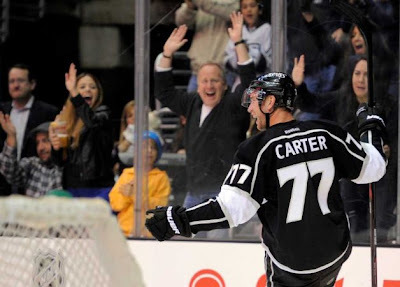 A catalyst for this sudden improvement, Jeff Carter. The Kings acquired Carter several days before the trade deadline, and he has given the Kings that offensive threat that has been missing for the majority of the season. In Carter's 13 games with the Kings, he has lit the lamp six times, and recorded three helpers. Mike Richards, who was reunited with former teammate Carter, has recently rebounded from a career high 25 game goalless drought and notched two goals in his last four games, including a short-handed goal against San Jose. In order to help turn this team around, the Kings' captains have lead by example. During the Kings current winning streak, alternate captain, Anze Kopitar, who leads the team in points, goals, and assists, has recorded seven points during their current winning streak and has scored seven goals in the Kings last 13 games. Captain, Dustin Brown, who was apparently being shopped around at the deadline, has silenced critics with his recent play. Brown has recorded five goals, including a hat-trick, and eleven assists over the Kings past 13 games. Along with the star players, the Kings have been receiving an extra boost from players that have not contributed as frequently as most would like. Dustin Penner has scored twice and recorded three points in his last three games, rookie, Dwight King, has grabbed ten points since getting the call up, and defense-man, Drew Doughty has recorded five points in his last six games. If the Kings can continue this scoring and prove it is more than just a surge that will eventually die out, they will possibly sport the most well rounded team going into the playoffs. A Vezina worthy goalie, a top five defense, and an offense that can score is a scary opponent for any come playoff time.